At least 24 persons, 17 of them schoolchildren, were killed and 25 injured today when their vehicles plunged into the Damanganga river when a dilapidated bridge collapsed due to heavy rains in Daman and Diu. 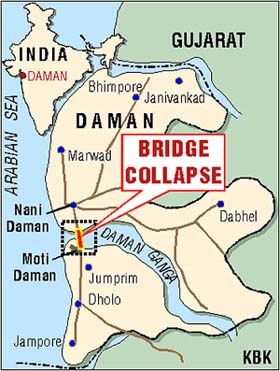 The children in the age group of 10 to 15 were returning from school when the 100-year-old bridge connecting residential areas of Moti Daman and Nani Daman gave way, official sources said. Unconfirmed reports, however, put the toll at 30. Six of the seriously injured have been admitted to Haria Hospital in the neighbouring Vapi town, while five were being shifted to Mumbai. The other injured were receiving treatment at local hospitals in Daman.